Problem Statement: The trend towards decreasing device sizes and increasing frequencies (e.g. high frequency, high power density, wide bandgap material electronics) lead to non-equilibrium transport conditions between the electrons and phonons in semiconductor devices. The assumption that electrons and phonons are in equilibrium is no longer valid. In these non-equilibrium conditions, commercial Technology Computer-Aided Design (TCAD) tools are difficult to converge when coupled with energy equations. Solution: The coupling between electrons and phonons and the effect on the electrical performance needs to be accurately estimated via Boltzmann transport equations (BTE) or quantum transport method. The quantum transport methods are computationally expensive and are not able to fully model micron-sized devices. ACT developed BTE-based physical device model with temperature dependent material properties as input. ACT has developed high fidelity models to simulate the performance of next generation wide bandgap semiconductor devices, such as GaN and SiC. These models with temperature dependent material properties are able to accurately predict the electrical performance of the existing devices in demanding conditions such as high temperature, high power and high frequency. Furthermore, these models can be used to accurately design the next generation devices, which would be cost-and time-beneficial. 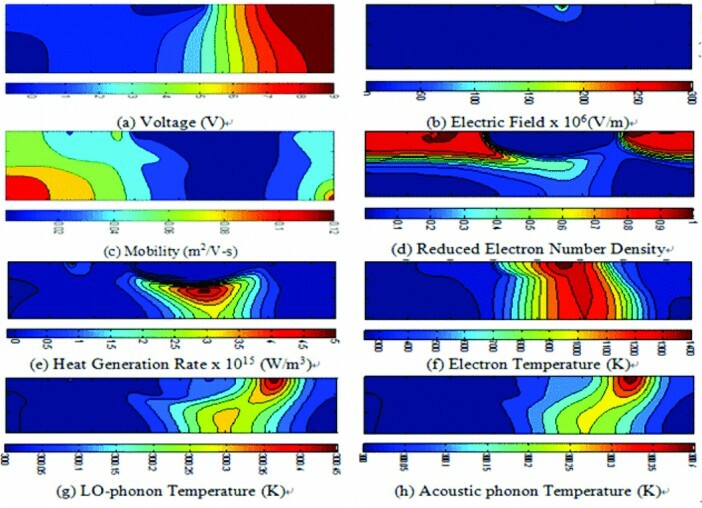 Identified heat generation sites due to scattering under high electric field and extracted heat generation rates for high fidelity prediction of thermal profile across the device. Coupled heat sink conditions, e.g. natural or forced convection cooling, with device-level electro-thermal equations for designing thermal management solutions. Figure 2: Calculated results for a GaN MESFET (Vds=10V, Vg=0V, t=17ps) including (a) voltage, (b) electric field, (c) electron mobility, (d) reduced electron number density n/ND, (e) heat generation rate, (f) electron temperature, (g) LO-phonon temperature, and (h) acoustic phonon temperature. Please contact an ACT representative for additional information on the detailed modeling techniques and the range of devices that we can support.